Cheap places to have disc machined in northern suburbs? http://www.kyowadesigns.com/ Anyone ever heard of Kyowa racing wheels before? Seems like some generic Japanese wannabe wheels hence the cheap prices. Just wondering if anyone has delt with this brand before? They look nice. Thanks for all your answers much appreciated! 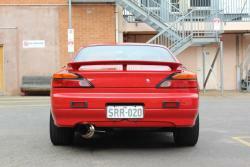 Hi guys, fairly new to the import scene, was previously a proud owner of an s15 but now I'm looking into buying a cheap track car 180sx. Before I get flamed please understand that I have no experience and absolutely no knowledge about drifting and very little knowledge about the tracks in SA e.g Mallala and Tailem Bend. And also I've never been to Mallala and Tailem Bend only heard stories and seen videos. Questions! What days are the tracks open for drifting practice and what are the costs like? Where and who can I get lessons from and how much will it costs? What basics do I need to know about servicing the car before and after a track day? Recommendations to cheap trailer hire or tow in SA? Recommendations to cheap drifting tyres? Recommendations to a car to buy? (I just figured S chassis were the best for drifting and 180sx would be the most affordable) Any help and advice will do. Thanks again from a newbie!! Hey guys, recently bought a x-trail and thought I should change the oxygen sensor due to the bad fuel economy. I've taken off the heat shield for the extractors, and managed to unscrew the oxygen sensor but for some stupid reason the plug is extremely difficult to take off. Is there any tricks to taking off the oxygen sensor plug? I dont want to spend $50 to change an oxygen sensor when my only issue to pulling the plug out. Ive had multiple friends and family attempt to take out the plug and fail. Any help or advice will do, much appreciated! Its only an x-trail I'm certain that it will pass through any inspection, doesnt bother me too much. Anything I should look out for just incase I get ripped off? Both sign rgo and tranfer papers and all sorted simple as that? How does the transaction work exactly? Never bought a car from interstate. I just sign the rego papers to transfer names, and thats it? What else would I need to do in SA? Would I need to take it through to regency to have the car checked? Hey guys, found a car on carsales from Victoria (X-Trail), and was wondering who or what company/business I would call to have check the vehicle for me and give me the thumbs up, before I fly to Melbourne and pick it up and drive it back to Adelaide. In SA we have RAA to check vehicles, not sure is Vic uses RAA????? The mechanic had a look as it and he suspects its the rear extension seal leaking. Is that any worse than the front main seal? If it is the rear extension seal, can it get any worse if I leave it? I dont rememeber what the mechanic told me. ==' Did a google search, seems as if its common with gearboxes and can be left? Hey sharkey how much do you charge to degrease the whole engine??? And where abouts are you located? I hope this picture will do. I probably should have mentioned, I dont plan on using this vehicle for towing, or driving long distance to the outback/countryside, I was after a big comfortable car that will last and is cheap to maintain. Used as a daily driver to and from work and weekend activities. At this moment the x-trail seems most appealing. If anyone has any opinions on the x-trail or the choice of car I plan to buy for its use please give me your opinions.